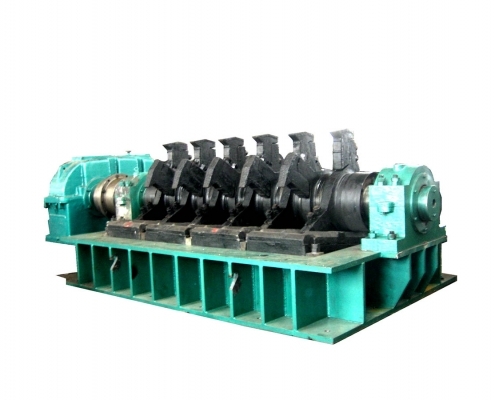 The single-toothed roller crusher actually combines the jaw crusher and part of the structure of the roller crusher, thus having the characteristics of both crushers. The single-tooth roller crusher has a large feed port, and the roller surface is equipped with different crushing racks. When the bulk material is fed, the higher rack clamps the bulk material and cracks and impacts. The method breaks it up, then falls to the bottom, which is then further broken to the required size by the smaller teeth. In a crusher, there are pre-crushed areas and secondary crushing areas, so it can be used for coarsely crushed materials, and the crushing is relatively large, up to 15. When it is broken, the block is pulled out of the machine by the tooth ribs on the roller, so it is forced to discharge. The single-tooth roller crusher is suitable for the rough-breaking operation of metallurgical sinter of working temperature below 900 °C in steel production enterprises; it is suitable for coarse crushing and medium-breaking of hard brittle materials with no crushing pressure of more than 20KN/cm2 in concentrating plant, stone material plant and power plant. Broken work. 1. The toothed roller shaft, crown and jaw of the single-tooth roller crusher all adopt the internal channel water cooling system, and the cooling effect is excellent (after 10 minutes of shutdown, the crown temperature is only 60 degrees Celsius). 2. The single-tooth roller crusher reducer adopts a fully enclosed gear box structure, which has low running noise and ensures no oil leakage. 3. The single-tooth roller crusher adopts fully enclosed rolling bearings, which is easy to maintain and reduces maintenance costs. 4. The single-tooth roller crusher is arranged by spiral toothed rollers to extend the life of the crusher by 1-2 times. 5. The tooth plate of the single-tooth roller crusher is fixed on the hub by screws, which is easy to replace, saving time and effort. 6. The single-tooth roller crusher adopts the alloy steel tooth plate and the surface is covered with the wear-resisting wear layer to ensure a long life of 4000 hours. 7. The safety roller bushing is set at the driving end of the tooth roller of the single-tooth roller crusher, and the crusher is overloaded and immediately implements the shutdown protection.